A RUDN chemist has developed a new method for synthesizing "yolk-shell" nanoparticles on the basis of titanium dioxide and graphene. The complex structure of the new particles allowed the scientists to carry out a selective oxidation for aldehyde production for many hours without the formation of any byproducts. The research was published in Applied Catalysis B: Environmental. This type of reaction is used to produce aldehydes—chemical compounds used in the manufacture of many medicinal drugs and vitamins. As a rule, aldehydes are obtained from aromatic alcohols with the help of often toxic metal oxides at high temperatures. 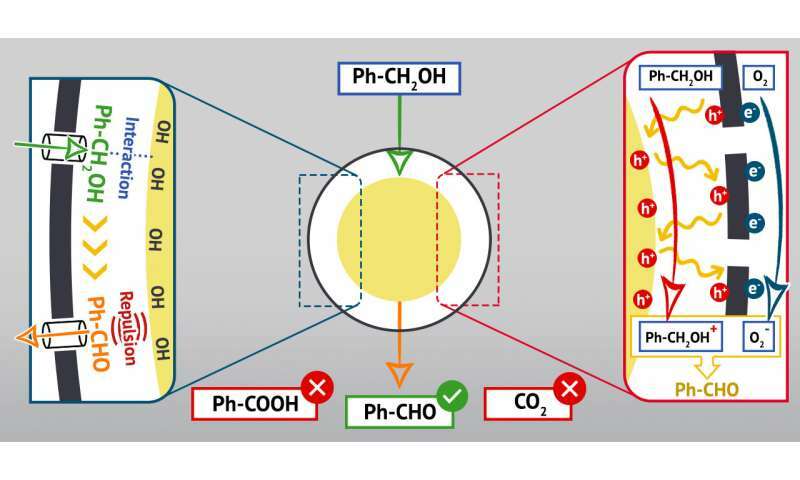 Photocatalytic reactions are more eco-friendly but not selective enough—the aldehydes produced by the process will also start to oxidize, too, and numerous byproducts are formed. RUDN chemists managed to solve this issue by using nanocatalysts with an unusual structure. The particles of this type have a gap between their nucleus (the "yolk") and the outer shell. The chemists synthesized structures of this kind from titanium dioxide that is recognized for its photocatalytic properties, and then added graphene to the surface of the shell. The flat surface and optical properties of this two-dimensional material enhance the catalytic activity of titanium dioxide in various ways. They allow reagents such as aromatic alcohols to easily infiltrate the particles, broaden the spectrum of light absorbed by each particle, and improve charge transfer in the material. The reaction between titanium dioxide and its graphene envelope provides for additional properties of the new catalyst. The bond between titanium dioxide and graphene in the experiment was provided by nitrogen-containing compounds (amines). Nanoparticles showed high selectivity: Ninety-nine percent of aromatic alcohols in these reactions turned into aldehydes, and this productivity level remained for 12 hours of reaction. No byproducts formed in the course of the reaction under the influence of visible light, i.e., no peroxidation took place. The RUDN chemists believe this is due to the properties of the nanostructures which are virtually nanoreactors. The light penetrates the structure and is reflected and scattered within them influencing the molecules of organic reagents accumulated between the "shell" and the "yolk". Aldehydes obtained in the course of such a reaction are relatively hydrophobic, while the "yolk" from titanium dioxide is hydrophilic. Such substances rebound, and therefore the aldehydes are quick to leave the nanoreactor. This is why there is no overoxidation. "This is another part of our studies on the design of advanced photocatalytic nanomaterials research," says Rafael Luque, director of the Center for Molecular Design and Synthesis of Innovative Compounds for Medicine, and a visiting scholar at RUDN. "The nanostructures showed excellent photocatalytic activity, but more importantly, the aldehyde was still obtained as single oxidation product after 12 hours after its start, rather unprecedented in literature. The materials were also highly stable and reusable. Right now we are studying their new properties, including the ability to disintegrate pollutants under visible light."